New Zealand’s premium apple-growing regions: Hawke’s Bay, Nelson and Central Otago. You can trust our fruit quality and our experience because we have been supplying the highest quality fresh apples to the world, at competitive prices, for 20 years. Fern Ridge Fresh will supply you with top quality crisp fruit, in the best condition, ready for your markets right when you need it. Fern Ridge Fresh has extensive experience with shipping and logistics that you can rely on. 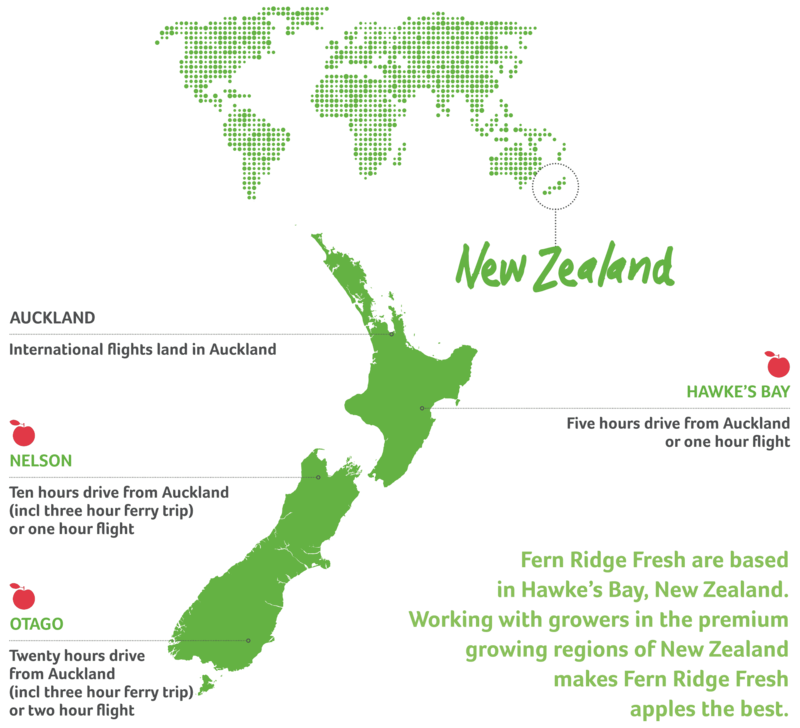 When you pick Fern Ridge Fresh, you Pick New Zealand’s Best. Every step of the way; from tree to carton, from ship to shore, our apples are treated with the utmost care. New Zealand’s best growers produce tasty and nutritious apples with great colour. Our apples are fully traceable and Global Gap accredited. The Fern Ridge Fresh team offers integrity, reliability and experience, and we will go the extra mile to ensure customer satisfaction. © 2017 Fern Ridge Fresh. All rights reserved. Site by Quest.